You can download GeeXLab 0.10.0.0 from THIS PAGE. The startup scene is nothing more than a regular GeeXLab demo that has been embedded in GeeXLab. You can access to its source code with live coding tools. Ok, even if Vulkan support comes in second position in the release highlights, Vulkan is the big thing of GeeXLab 0.10.0.x. 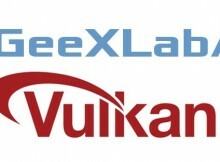 I will detail in another post how to play with Vulkan in GeeXLab. Now, all you need to know is that Vulkan support is far from complete, only basic functionalities have been added: you can load SPIR-V shaders and textures (2D + array), create pipeline objects, descriptor sets and GPU buffers. 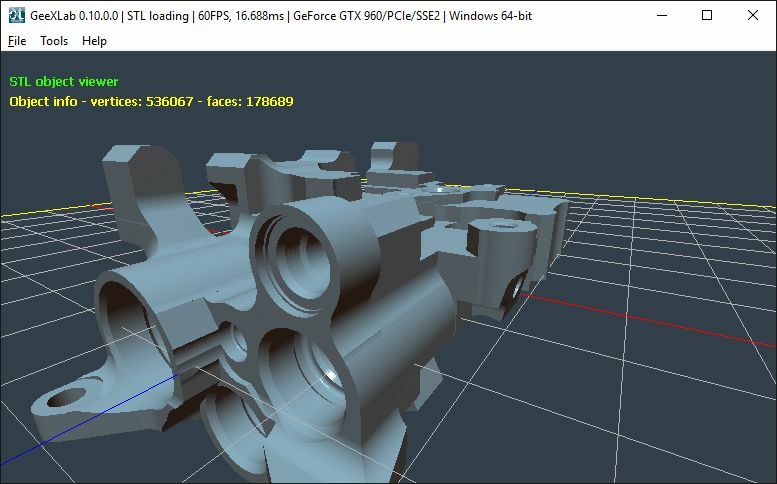 Other functionalities such as render targets (for post processing) will be added later. Check this WIP thread for updates. 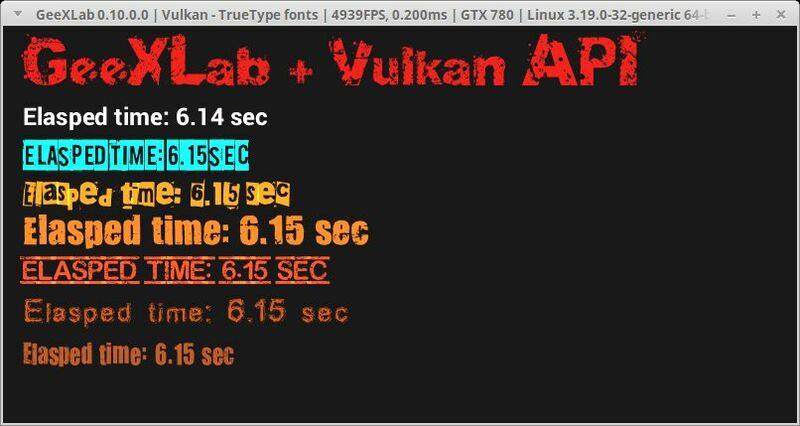 Vulkan is available in a plugin that is dynamically loaded when a Vulkan demo is started. 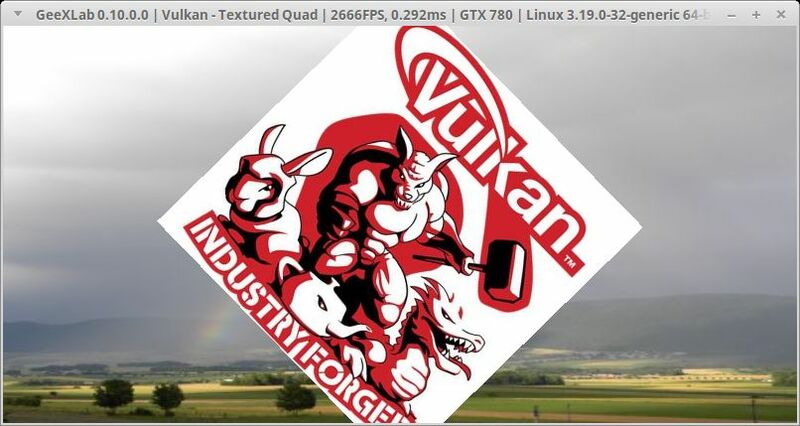 The Vulkan plugin is available on Windows 64-bit and Linux 64-bit. 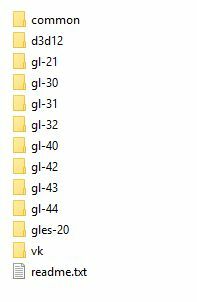 I will release the Windows 32-bit version with the full release of GeeXLab (windows, linux, osx and rpi). The code sample pack has been entirely re-organized. There are now separate folders for each 3D API supported by GeeXLab: OpenGL (2.1, 3.2, 4.0, etc), OpenGL ES 2.0 (essentially for the Raspberry Pi), Direct3D 12 and of course Vulkan! To display text in Direct3D 12 demos, I recently added the support of fonts via Direct2D. This support works but it is very slow and is limited to D3D12! It was time to have an unified TrueType fonts management that works across all 3D APIs and platforms. For that I used that nice library: stb_truetype.h. Now I have a decent font management that works everywhere: on all platforms (Windows, Linux, OSX and Raspberry Pi) and with all 3D APIs (OpenGL, Vulkan and Direct3D 12). What’s more, the new font lib is embedded in GeeXLab, a plugin is no longer required. All new functions are available via the new Lua/Python library: gh_font. I will explain how to use it in an upcoming post. If you’re impatient, just look at the code sample pack (gl-21/font-truetype/ or d3d12/11-truetype_font.xml or vk/06-truetype-font.xml). GeeXLab supports now the STL binary (StereoLithography) format. More information about the STL format can be found HERE. STL files are available in two formats: text or binary. GeeXLab only supports binary formats because they are simpler and faster to load. 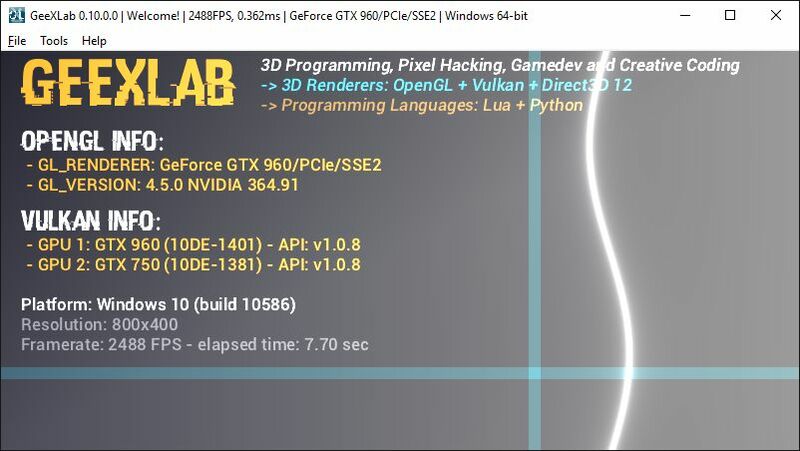 gh_gpu_program lib (lua / python). a particular GPU with Vulkan renderer. + added new gh_font lib to render texts using True Type fonts (lua and python). and draw_triangles(). Vertices must be defined in the vertex shader. gh_vertex_pool lib (lua / python). + added set_num_patch_vertices() to gh_renderer lib (lua). * fixed bug in gh_renderer.blending(). * fixed a memory leak in the FreeImage plugin. * [WINDOWS / OSX] bugfix: the log file is now correctly opened (Tools > Show log file).
! updated gh_nvg lib with latest version of NanoVG.